Vol. 3 No. 2 A poll by AAA found that only 6% of motorists thought they did most of their driving under severe service conditions, but further study showed it actually applied to 62% of drivers. So how can you tell which category your driving falls under? Let's take a look. Engine Oil is Truly the Lifeblood of Your Vehicle Even novices know that engine oil acts as a lubricant between mov- ing parts such as the piston and the cylinder to prevent metal-to- metal contact. But oil also serves as a coolant, taking away engine heat to help prevent damage to engine components. Unfortunate- ly, this same heat breaks down the oil, changing its viscosity and therefore, its ability to do its job. Heat and contaminants also af- fect the life of additives, such as inhibitors that prevent corrosion and detergents that help keep the engine clean. Finally, engine oil will become diluted over time due to the collection of fuel and moisture in the crankcase. This is exacer- bated by frequent cold starts and short driving trips, which prevent the engine from reaching its nor- mal operating temperature. So, Should You Follow the Normal or Severe Schedule? Of course, no matter how you drive, your engine oil must regularly be changed. 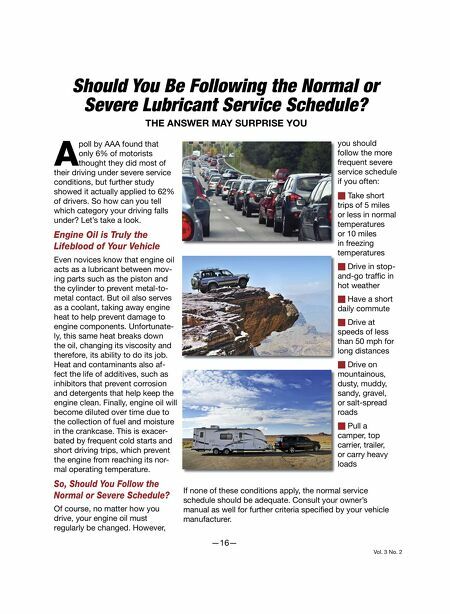 However, Should You Be Following the Normal or Severe Lubricant Service Schedule? —16— THE ANSWER MAY SURPRISE YOU you should follow the more frequent severe service schedule if you often: ■ Take short trips of 5 miles or less in normal temperatures or 10 miles in freezing temperatures ■ Drive in stop- and-go traffi c in hot weather ■ Have a short daily commute ■ Drive at speeds of less than 50 mph for long distances ■ Drive on mountainous, dusty, muddy, sandy, gravel, or salt-spread roads ■ Pull a camper, top carrier, trailer, or carry heavy loads If none of these conditions apply, the normal service schedule should be adequate. Consult your owner's manual as well for further criteria specifi ed by your vehicle manufacturer.